Find yourself in the very heart of one of the most adventurous and exciting cities of the world. Sky Loft offers high-end luxury accommodation; we invite you to experience comfortable, sleek interiors and witness a front-row spectacular when the city lights come alive and frame the lingering sunset over the horizon. This large, luxury three bedroom Darlinghurst apartment boasts some of the best views of any sub penthouse accommodation in Sydney. Sky Loft sub-penthouse, situated in Sydney's desirable Darlinghurst, is the ideal short-term rental or long-term accommodation for those who lust after the excitement, convenience and luxury of city life. Established as a fully furnished three-bedroom apartment, this property is suitable for both the single guest as well as a family. Sky Loft is swallowed by the eccentric vibes radiated off its lively Victoria St address. From the balcony, an aroma of freshly grounded coffee beans pleasantly congests the air from the wide selection of fabulous cafes. The Darlo' nightlife beckons you to an experience of fine dining restaurants and the slickest cocktail bars in town. Meander down Victoria St to Li'l Darlin to try one of their irresistible Lychee Martinis or stroll directly across the road to indulge in Portuguese tarts and home-made Italian sandwiches at our favourite café, Latteria or chill out in the brand new hot spot Jekyll & Hyde Coffee and Wine Bar. This three-bedroom style oasis offers two stylish en-suites, with one located in the lush and luxurious king-size bedroom. The master bedroom is further completed by a double shower and lustful walk-in-wardrobe. Fine timber finishes and Carrera marble elegantly fixate the interiors of Sky Loft. A chef would simply feel right at home in Sky Loft's kitchen domain; it is decked out in Electrolux appliances, two ovens, a gas and induction cook top as well as a huge entertaining island bench. 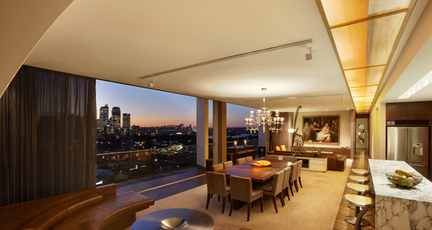 So... who's inviting us over for dinner overlooking the Sydney sky-line?! Sky Loft holds the potential to be the perfect environment for entertaining your guests. It has two lounge room settings and a dining room, seating up to twelve people. It has a spectacular balcony that runs along the length of the apartment; it is here we insist you spend most of your time taking in the magnificent harbour views and ‘Instagramming' the magical moment when the peach and yolk tones frame the city high-rises. This property is the epitome of a self-contained apartment. It has an internal laundry, air-conditioning, secure parking with two spaces, access to the buildings gym with Harbour Bridge views and a lap pool. We completely understand you may not want to leave the Sky Loft once you have arrived but we urge you to explore its fantastic surroundings! One bedroom 'Sky Pad' apartment available on same floor! Elevated above the city, Darlinghurst is within walking distance to the CBD of Sydney and the centrepiece of the surrounding inner-city suburbs of Paddington, Surry Hills, East Sydney, Potts Point, Kings Cross and Elizabeth Bay. This the perfect location for those who wish to interact with creative locals and urban life. $1200 per night, minimum stay 5 nights. One week minimum applies for Christmas and New Year periods (price on application). Long stay rates available.